At USA Professional Karate Studio, we have served thousands of children in the greater Pittsburgh area for more than 35 years with valuable life skills through our Kids Karate Classes. We have an extensive and most exclusive program designed for each age group beginning at age four. In addition to self-defense training, students of all ages develop lifelong skills including: respect, discipline, confidence, integrity, improved focus, and more! 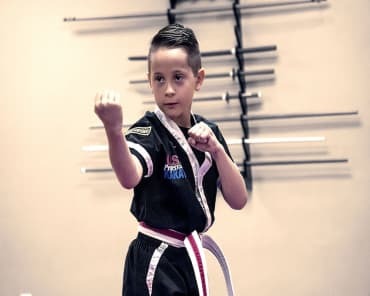 Our highly skilled instructors at USA Professional Karate Studio, offer specialized Kids Karate classes that address the unique skills and challenges that children of all ages face. Beginning at age four with the most basic of instruction, and building through age 12, our children's programming fosters confidence and independence in the children of our community. Tigers (Ages 4-5): Our Tigers program is not curriculum based but themes based, including very simple reinforcement homework every week with coloring and simple, fun exercises. Our monthly themes include life skills, safety skills, and of course, karate basic skills. Don’t worry if the children don’t do exactly what the instructor is presenting. Students at this age are learning about life and karate, so we break up self-control-activities with periods of fast, fun activities that will get the silliness out every few minutes! Parents are impressed with their child’s quick learning of respect, manners, focus, and a love for learning. Little Ninjas (Ages 6-7): Each student will develop a solid foundation in karate stances, basic techniques, sparring combinations, self-defense, and kata (sequential pre-arranged karate techniques). Plus, children will learn character development, life skills, and safety skills; physical fitness and coordination; and self-defense including bully defense and stranger awareness. See more at out Hyper Bully Defense Workshops! Eagles (Ages 8-12): We coach each student based on the specific way that they learn, in the nurturing, respectful atmosphere that our group classes provide. Each student not only learns Karate but also how to learn while focusing their mind and body on karate skills, fitness and coordination, and character goals. Our confidence-building Bully Defense program equips children to consider and respect others, and even to become the protectors of others in their families and at their schools. See more at out Hyper Bully Defense Workshops! During each of our Kid's Karate Classes, your child will begin to develop important learning skills that will greatly benefit them in the classroom, at school, and in their everyday lives. And our Kid's Karate students often become leaders in their communities and respected members of society after learning valuable skills like: A sense of responsibility, improved socialization, leadership, and teamwork. Give Your Child The Tools To Succeed - Get Started Today! 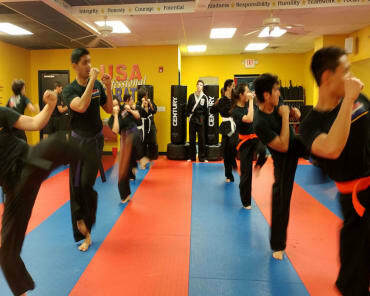 We can't wait for your child to join our Kids Martial Arts Classes at USA Professional Karate Studio. For more information or to get started today, simply fill out the form on your screen now and we'll take it from there!